Mari Ness has a post up at tor.com about this fairy tale, which is one of my favorites. [S]tories of brothers transformed into birds were popular throughout Europe, along with the motif of a young sister thought to threaten the family. In most variants, the brothers are transformed into ravens—that is, birds often associated with death, evil and trickery. In this version, the brothers are transformed into swans—a sign, the Grimms assure us, of their innocence. Or maybe an indication that Dortchen Wild just liked swans. Who knows? Well, as Mari Ness points out, various plot points in the fairy tale might not make perfect sense. 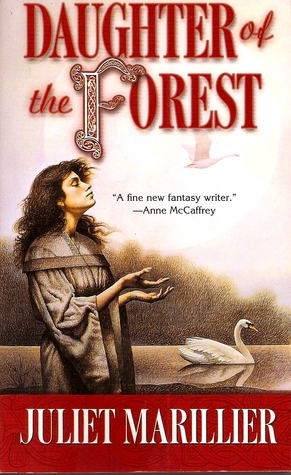 Still, as I’m sure you all agree, some of the modern retellings do a fabulous job with this one, and by “some,” I mean Juliet Marillier’s Daughter of the Forest. This is one of the all-time great fairy-tale retellings, in my opinion. The other Sevenwaters books that I’ve read are also good, although I’ve only read the first three and personally I recommend you skip the epilogue at the end of Book Three, Child of the Prophecy. I really ought to go on with the series. So many books, so little time. Previous PostGrammar Police make terrible writers: discuss	Next PostAirship! That’s a coincidence! I recently read a Six Swans retelling that I liked a lot, by Sarah McGuire: The flight of swans. It’s aimed at younger teens I’d guess, and grounds the story in Scottish and Irish folklore with a historic feel, which made it feel more realistic to me. Thank you, Hanneke, that definitely sounds good. I’m afraid I’m the outlier who doesn’t care for the Marillier retelling. I really didn’t like the worldbuilding.